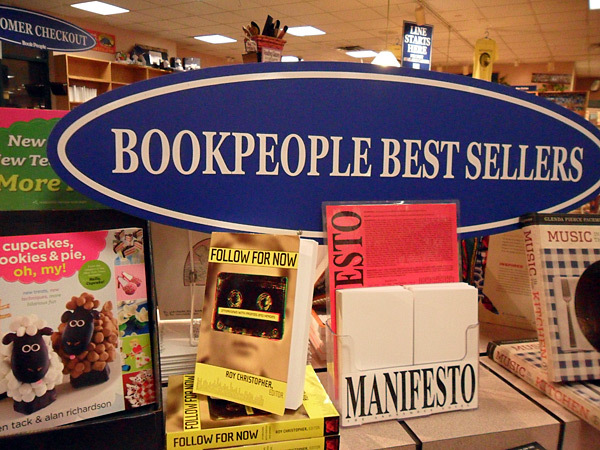 Follow for Now is now on the BookPeople Best-Sellers table here in Austin, Texas! 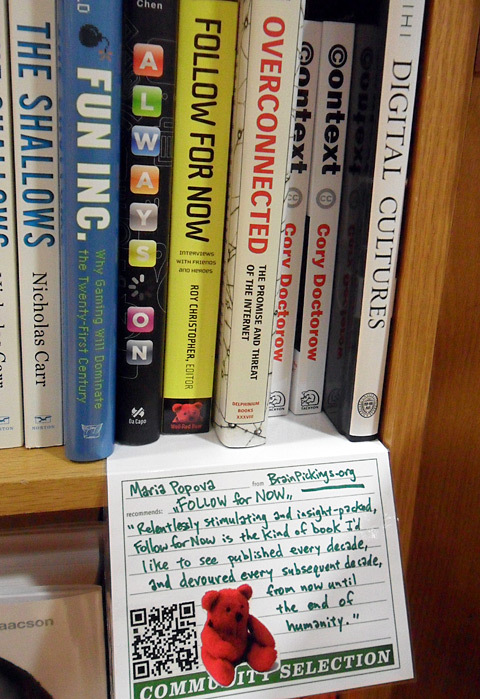 Thanks to Michael McCarthy, all at BookPeople, and you all for making this happen. 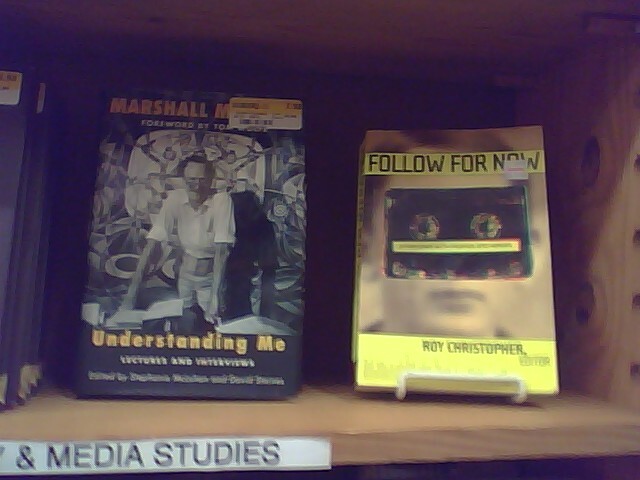 Yep, nearly five years after its release, Follow for Now is now available at BookPeople in Austin, Texas. As you can see in the photo below, it’s in the General Science section. From the desk of Frank Spencer, Follow for Now has been spotted. Frank is the principal at Kedge, which is a full-service foresight strategy firm that equips businesses, NGOs, and social initiatives with robust, adaptive and transformative capacity. Frank is a good dude, and I’m honored to have Follow for Now situated so close to his visions of the future(s). 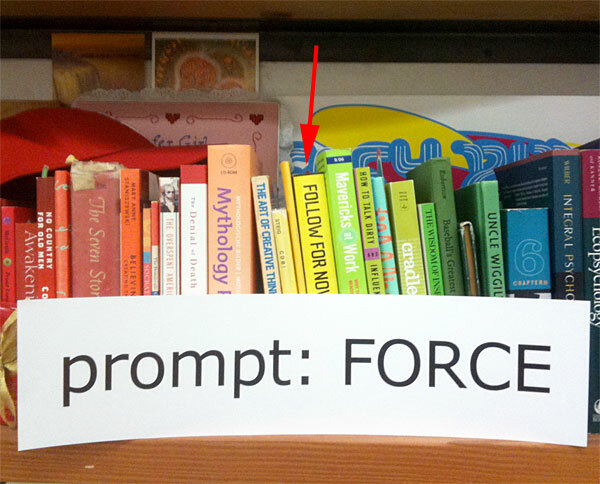 Jelly Helm is one of the most creative thinkers I know, and I am honored that Follow for Now is on the shelf in his studio. 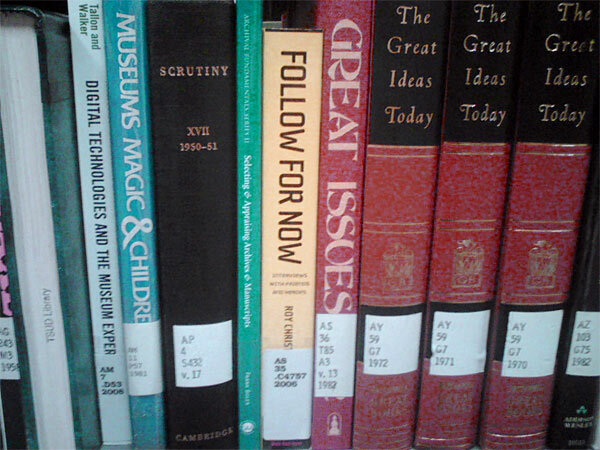 Right between books called Scrutiny and The Great Ideas Today, here’s Follow for Now chillin’ on the shelf in the Troy University library, Dothan branch. For my fellow University of Texas at Austin students who have yet to get a copy, Follow for Now is now available in the library. Check it out. As always, it’s still available at Powell’s, Amazon, on The Kindle, Google Books, Skylight Books, MonkeyWrench, Last Gasp, and at on this very site. My friend and colleague Mike Schandorf required Follow for Now for his Writing for New Media class this semester at the University of Illinois at Chicago. 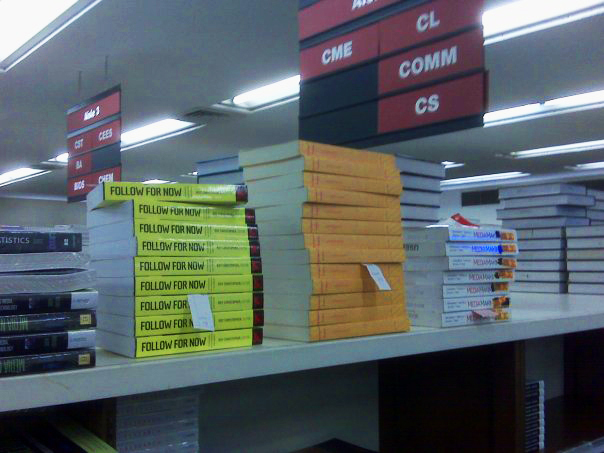 He snapped this shot of the stack of copies in their bookstore. I’m stoked. Many thanks, Schandorf. See you soonly. Now you can get Follow for Now for your Sony Reader (or other non-Kindle eBook device) via Google Books. 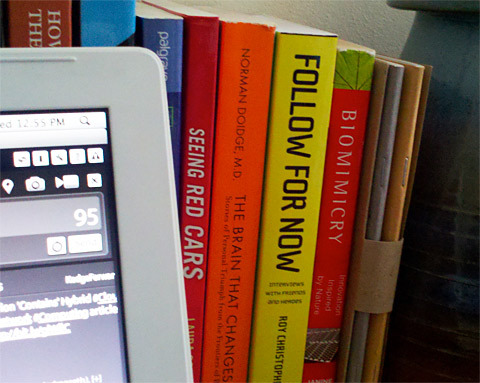 Their format allows you to read books on the screen of your choice.